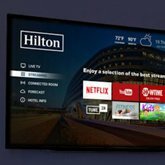 Hilton and Netflix are teaming up to allow guests to stream Netflix series, movies and more on in-room televisions in Hilton’s high-tech Connected Rooms. In a Hilton Connected Room, guests have the ability to control the temperature, lights, TV and more from their mobile device or the TV remote. The collaboration enables guests to access their Netflix account by logging in either with the remote control or the keyboard on the Hilton Honors app. Guests without a Netflix account will be able to sign up on the spot in their room and start watching immediately, while current Netflix members can start watching exactly where they left off before checking in. Hilton currently has more than 1,800 Connected Rooms and plans to roll out tens of thousands more across the US in 2019, as well as the first non-US locations.